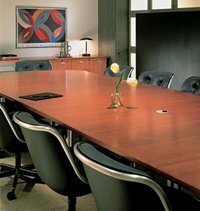 For over two decades, NorthPoint Office Furniture has been one of the leading sources for new and gently used office furnishings for businesses, organizations, and residences throughout Atlanta, Georgia. Family-owned and -operated, our goal is to deliver first-rate office furniture solutions that accommodate each customer’s budget and deadline. By exclusively offering the finest products available from the industry’s premier manufacturers, such as DMI, HON, Martin Home Furniture, and Fairfield, NorthPoint Office Furniture allows you to wholly count on long-lasting durability, comfort, and style when you shop with us. Additionally, all of our furnishings come with generous manufacturer warranties for your continued peace of mind. Whether you’re searching for a traditionally ornate conference room table to impress potential clients or you’re in dire need of simplistic reception area furniture, NorthPoint has you covered. Our gorgeous 8,000-square-foot showroom provides fully staged displays that allow customers to easily envision our office furniture in their own Atlanta, GA, home or office. Furthermore, as part of our ongoing commitment to superior customer service, one of our friendly professionals can assist you in space planning to maximize the potential of your office as well as financial consulting to ensure you get the right pieces for the best price. For more information about the quality furnishings that we proudly provide residents and businesses of Atlanta, GA, contact us today or visit our exceptional showroom where office furniture is truly made easy.